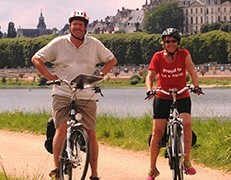 We offer luggage and bicycles transfers as well as passengers transport (with luggage and bicycles) between all accommodations along the "Cycling the Loire" itineraries between Orléans and Angers, in both directions. These itineraries include the areas of Chambord - Cheverny, Chenonceaux, Azay-le-Rideau, Chinon and Fontevraud (see sales conditions for more details). No more concern about the luggage transfer or the return of the bicycles to the rental company when travelling along the Loire Valley : a unique service for any type of transfer and transport, including passengers transport to go back to the starting point of your tour. What kind of luggage do you transfer? We canoe on the Loire River. Could you transfer our luggage and our canoes?